This classic of landscape architecture has been required reading for the residential garden design professional, student, and generalist since its publication in 1955. 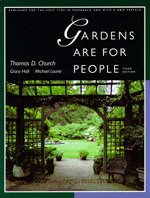 Gardens Are for People contains the essence of Thomas Church's design philosophy and much practical advice. Amply illustrated by site plans and photographs of some of the 2,000 gardens Church designed during the course of his career, the third edition has a new Preface as well as a selected bibliography of writings by and about Church. Called "the last great traditional designer and the first great modern designer," Church was one of the central figures in the development of the modern California garden. For the first time, West Coast designers based their work not on imitation of East Coast traditions, but on climatic, landscape, and lifestyle characteristics unique to California and the West. Church viewed the garden as a logical extension of the house, with one extending naturally into the other. His plans reflect the personality and practical needs of the homeowner, as well as a pragmatic response to the logistical demands of the site. Thomas D. Church (1902-1978) was an internationally acclaimed landscape architect and the recipient of many awards during his lifetime. GraceHall was Church's assistant, and Michael Laurie is Professor and Chair of Landscape Architecture at the University of California, Berkeley.